My friend Maureen gave me wonderful gifts for my 40th birthday. Not only did she throw a large, very pleasant party for me that included homemade beer, my favorite live dance band (Rhythm and Blues Review). She also took me on a weekend trip to Charleston, South Carolina. As a city planner and urban designer, I've always desperately wanted to visit and walk Charleston, because it is known as a "Mecca" for planners throughout the world due to its very impressive urban design features. Much of the city seems frozen in time-which is fortunate, since so much of the city was built centuries ago using timeless development principles. The architecture of the city is spectacular. There are a number of tall, impressive church steeples-many of which "terminate street vistas," which is a very important urban design tool, because when a building is placed at the end of a street, it becomes very visible and sends a message that it is an important building for the community. It is therefore important that the key civic buildings should terminate vistas. By doing so, they create a tremendous degree of civic pride. In addition, these terminations make walks along such streets more memorable, picturesque, and pleasant (pleasant not only because it is beautiful, but because if you can see a building at the end of a street, you have a destination that makes the walk seem less than endless). The photo at left shows St. Phillip's Church, perhaps the most famous street termination in the U.S. This Episcopal Church was first built in 1680. The current structure was built in the 1830s. Its bells were converted into cannons during the Civil War. On July 4, 1976, new bells were installed in the steeple. Because of the prominence of the churches, Charleston is known as "The Holy City." Charleston contains a great deal of charm, in part due to its having a few old cobblestone streets downtown. East Bay Street has several colorful building facades right on the sidewalk-another important urban design feature, because the tradition of buildings against the sidewalk helps define the "public realm" by forming an "outdoor room." The pedestrian feels more comfortable when the space is defined and enclosed, instead of the exposed feeling one experiences when walking next to a large asphalt parking lot. In addition, buildings on the sidewalk, as is so much the case in Charleston, create a more interesting and safe walking experience, since the pedestrian can look into windows at office or retail activity, or say hello to someone on the porch. Safe because buildings next to the sidewalk help put "eyes on the street"-a form of citizen surveillance that police officers cite as being important for security. Along East Bay Street, we walk by "Rainbow Row," which are early examples of 18th Century wharf buildings that were used for businesses (first floor) and residences (second floor) for merchants. The buildings were restored in the 1930s, and have bright colors that mimic colonial Caribbean architecture. We take both a "walking tour" and a "carriage tour," each of which are led by knowledgeable guides who provided several details along the way. One of our stops is the famous "Four Corners of Law" in the downtown. At this intersection, there is a different branch of law at each of the four corners: City Hall, a Federal post office, a state courthouse, and a church. Charleston has several very quaint alleys. Alleys are a sign of a quality town, partly because they provide a place to hide away things like garbage, garages, and utilities that are unpleasant for a pedestrian. Another thing the city is famous for is its unique, signature "single house" (see photo above). In order to conserve space to maximize the number of houses that could be built, many historic district lots are long and rectangular, but are very narrow at the street. Several houses face sideways along the street, with an entryway leading from the sidewalk to a large porch or piazza. The grand front of the house faces the sideyard. This also provided an ample amount of cross-ventilation for those hot summer months. 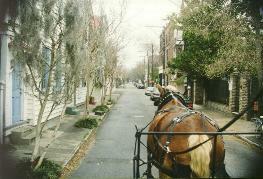 One of our tours of the city is in a horse-drawn carriage (see photo). The city is so crowded with tourists and tours filled with people seeking to soak in the lovely, historic nature of Charleston that carriage tours are now set on a lottery system, and are not allowed at night to minimize burdening certain neighborhoods with too many noisy carriages. Each carriage cues up for a tour and awaits word from a person with city government who randomly selects a tour that the carriage can go to, which promotes fair dispersal. We stop at Southend Brewery and Smokehouse on East Bay Street following one of a number of delicious, affordable meals we have in the city. We find that there are several excellent, modestly-priced restaurants in the city. Specialty cuisines seem to be seafood and Italian. The brewery is a microbrewery full of pub-like character, where the beer served is brewed within the pub. We sit next to very large, shiny, brassy vats for brewing beer. The vats were enclosed in very tall glass cases and lighted to prominently display them. My selection was "East Bay Brown." A very tasty beer. A spectacular set of homes are found fronting battery park on the south end of the Charleston peninsula. They are quite colorful (see photo below right), and appear to be in a proud, much-sought-after location. I discover an important criterion for how walkable a city is during my Charleston visit. There is a direct, positive correlation between how wonderful the walking is in a town and how sore my legs feel after the visit. And my legs feel very sore afterward. 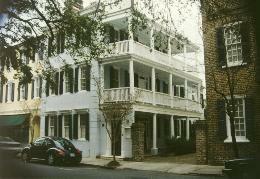 We stay at the 1837 Inn on Wentworth Street. It is a lovely house near the historic downtown, and was built in the 1830's. Our bedroom is quite elegant and comfortable. The bathroom contains a traditional, claw-foot bathtub that we very much enjoy soaking in after our long walks in the city. When we were there, the population within city limits was about 100,000. Approximately 500,000 live within the metro area, however. Overall, the city is very historic. An odd and surprising feature of the city is despite the fact that it is world-famous as a place to walk, nearly every downtown sidewalk is very narrow. What I learned from this is that mixing residential and non-residential buildings, and the proper design and location of buildings, parking and streets can make a walk very pleasant even if the sidewalks are not wide enough. At night, there is a very vibrant nightlife. The city was founded and settled by English colonists in 1670. 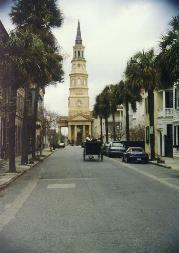 Charleston grew from a modest colonial harbor town to a wealthy city by the middle of the 18th century. Charleston found wealth into the 19th century from rice, cotton, indigo and its port activities. In April of 1861, Confederate soldiers fired on Fort Sumter in Charleston Harbor, which we visited by tour boat, thus signaling the beginning of the Civil War. In contemporary times, the major sources of capital have come from the U.S. Naval Base, the medical complex, the College of Charleston and growing tourism. 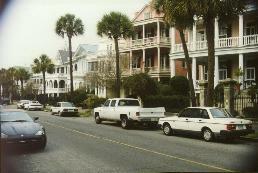 In 1980, an estimated 2.1 million tourists visited Charleston and by 1995 that figure soared to 5 million, infusing the county with an estimated 1.5 billion visitor dollars. I was so impressed with Charleston that I am not at all surprised by how many people are attracted to spend time in the city. It is truly a timeless jewel. The city was founded in 1670, and has survived for over 300 years, despite hurricanes, earthquakes, sieges, floods fires, and epidemics. Sensing long ago the need to protect the timeless, charming features and dignity of the city, residents adopted the first historic preservation ordinance in America. For almost 50 years, the city-because of Anthony Ashley Cooper, Earl of Shaftsbury-had the only nobility in the history of the United States. Barons, dukes, and earls owned grand plantations during this period. Charleston also established the first playhouse solely for drama, the first museum, the first fire insurance company (half the city was destroyed by fire a year after the company was created), the first public school, and the first municipal college in America.